Ever wanted to give a little back to your local community? Then why not use the medium of sport to raise money for your favorite charity? It doesn’t matter whether you are sporty or not. All you need is a general interest, and you can achieve some amazing things, as well as raising vital money. There’s a lot of different things you can do for all ages and experience – here are some ideas to kick start your fundraiser. Let’s start with something easy on the body! Why not get everyone at your workplace in an ‘office sports’ fundraiser. It’s a perfect alternative for those whose bodies are a little less suited to a lot of physical effort. Keep things easy and fun. Competitions like a chair race or throwing scrunched paper into a bin from a distance are great starting points. Try charging entry to everyone involved, and also run a book so that people can bet on who will come first, last, or make the most mistakes, etc. Offer prizes for the winners, and give the rest to charity – it’s that simple. It’s easy to get started, too – with very few startup costs. As long as you get the boss’s permission, it’s a quick and easy way of raising money for any charity. Here’s another activity related to sports that are perfect for anyone with doubts about their physical prowess. 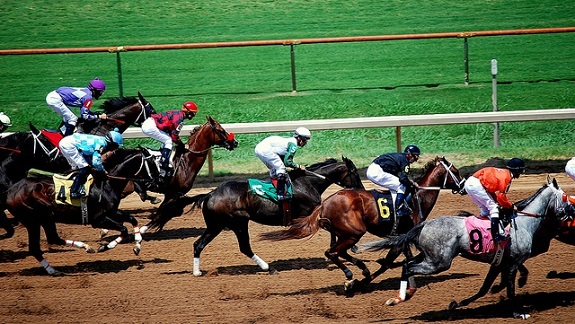 Try running a sweepstake in the office for a major sporting event – or a broad range of events. Take a look at a sporting calendar and highlight every tournament or competition that are worthwhile. Everyone pays a small fee every month, and you give a small prize to monthly winners – and a grand prize to the overall champion. Using monthly awards will keep people interested, even if they have no hope of winning the grand prize. Over a season, you can raise a significant sum – and it’s so easy to get started. Charity race nights are a lot of fun for all ages. You can either choose a proper day’s racing and watch it on the TV or buy a DVD or Blu-Ray with lots of different horse races on it. Think about hiring a local sports hall or community center – or even do it from home. All you need is a large projector or TV screen, and someone to run a book. The person who guesses the most winners gets a big prize – and you can offer awards to the runners up, too. Offer small prizes for the winner of every race, too. It will keep people interested in the day’s events, no matter how unlucky they have been previously. Now, doing activities like skydiving for charity can cause friction in some people’s eyes. In effect, you are raising money to have an amazing experience, and often the charity ends up with only a small portion of the fundraising. It’s a cheap way of fulfilling your dreams, in other words. So, if you want to raise money for your chosen charity by jumping out a plane at 15,000 feet, pay for it yourself. Then start raising money from your friends and relatives, so that all the money goes to charity. The idea of doing something for charity is to be selfless – so it’s important to commit to that philosophy. Do so, and people will be willing to give you more money if they know it is going to a charity, rather than helping you fulfill a life goal. If you know enough people who love a particular sport, why not set up a 24-hour game? It doesn’t matter what it is – from soccer to touch football. You could even do 24 hours of aerobic exercises or a fitness class. Put the word around and you should attract dozens of other sports players who will be willing to take part. Sure, it’s going to test your strength, stamina and you will be pushed to your limits. But, if you have enough people on hand to help, it is an excellent way to raise considerable funds. The more people that take part, the more likely you will get to your fundraising target. And, of course, the more help you will have to complete the task! Why not organize a charity golf tournament? Golf clubs will often be happy to give you reduced rates, as it helps their reputation and gives them exposure. And, you might even find that local celebrities and businesses will be very interested in taking part, too. If you do find any famous people who are willing to get involved, think about using them in the best way. A lot of people will pay good money for the chance to play golf alongside their heroes. So, don’t be shy in promoting any famous guests – they will be an asset to your tournament. All you need to do is charge each player a fee to enter the competition and organize a prize or trophy for the winner. The great thing about golf tournaments is they require little effort on your part, and if they success you can arrange to do it on an annual basis. Charity sports tournaments take some work to get off the ground because you aren’t just looking for individuals – you need teams. And, with so many different events taking place on the day, you will need to be sharp and on point with your logistics and organization. That said, it can be an incredible day – assuming the weather holds out for you, of course. You could invite local sports clubs, and encourage businesses to enter teams. You could have baseball, football, or soccer tournaments – all can be a fun day that involves everyone’s family and friends, too. Charge everyone an entry fee to compete, – and spectate – and organize some simple medals and trophies. Again, this is something you can do on an annual basis – and you can raise a lot of money for your favorite charity. There are plenty of marathons, half marathons and other running events that happen in every town and city. And, they are a great way of raising money for your chosen charity. But, why not arrange a charity run with a difference in your local area? You could make it fancy dress, give it a theme, and encourage families to take part together. Not only will you get serious athletes competing, but you will also widen your appeal to everyone else in your community. A lot of big races started off with humble beginnings – who knows; maybe yours will be an annual event for many years to come? Like cycling? In that case, why not plan out a difficult route that will take all your dedication and physical prowess to complete. If you are feeling really ambitious, you could try the coast to coast run – or just do part of the route if it’s too much for you. However, every area of the country has its cycling challenges, so find yours and start organizing your trip. Get a few friends on board, to help you promote and get as many riders as possible. It’s a great way to raise cash, and the sense of achievement you will have will be unbelievable. If you want to do something more family oriented, why not hold a sports day rather than a tournament? Organize lots of fun events – the egg and spoon race is a classic, for example. If you can arrange enough activities for all the different age groups, you will be onto a winner. You can raise money from race entry fees, and organize a food and refreshments stall to boost your funds. You can also set up a betting book, with the person guessing the most winners on the day winning a prize. If driving is your thing, why not arrange a charity road trip? You could go coast to coast – or even go abroad to achieve a bigger goal. In fact, the more extravagant your plans, the more you might raise. Just be careful of your costs, and try to get as much as possible through corporate sponsorship. If you spend too much money, the charity will get little for your efforts. Also, think about the vehicle you use to for the task. Try and put a special spin on it – perhaps you have an old banger in the garage, for example, or can get your hands on a classic vehicle. As you can see, there are plenty of things you can do with an interest in any sport to raise money. We all have causes in our lives that we want to donate to, but there’s no harm in having a lot of fun at the same time. Sport gives you an opportunity to push yourself to your limits, too. On the one hand, you will be raising valuable funds for a special charity close to your heart – and on the other, you will be achieving amazing things. What better way is there of fundraising? Any more suggestions to add? Let us know in the comments section below!